What makes this fruit plate so fresh and inviting? The fruit is fresh and ripe. Know what is in season. Some grocery store fruit may need a day or two before flavors are at their peak -- purchase early and allow time to ripen before serving. Any blemishes are removed when peeling and cutting fruit. The fruit is cut into bite size pieces. The fruits have complimentary colors and flavors. A nice arrangement -- consider a bowl, plate, mixed up or grouped in clusters? Color is vibrant. If not serving immediately, eep air from discoloring cut fruits by dipping pieces in a mixture of water and lemon juice and keeping tightly sealed until serving. Those mini bananas are simply irresistible! My friend Janet brought this fruit plate to our potluck dinner the other night. It looked so jolly, I just had to snap a picture before we dug into it! My friends are used to that by now. We couldn't stop talking about those a-peeling little bananas! A big cup of parsley, sage, rosemary and thyme with stamped vintage silver garden markers. This charming cup of herbs was my entry for a silent auction I attended a couple of weeks ago. I wasn't exactly sure how I would pot the herbs when I first came up with the herb garden idea, but it all came together when I spotted this big coffee cup! I already had the garden markers, so this just seemed perfect to go with them. In fact, if I had a good herb-growing window, I would make another one for myself. The picture does not do it justice though -- you can barely see the charming markers placed in front of each herb. 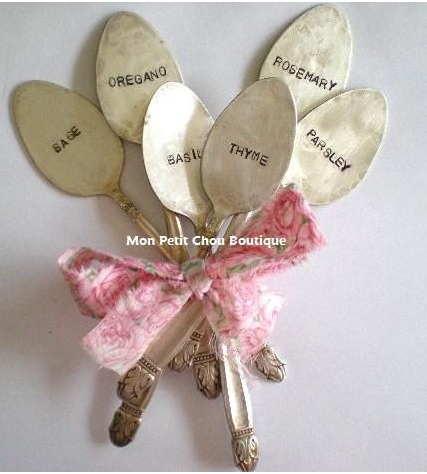 The vintage silver spoon plant makers were part of a bouquet of six I ordered from Mon Petit Chou Boutique on Etsy. I could spend all day looking at all the clever handmade and recycled items on Etsy. Thanks to Troy-Leigh for the use of the picture from Mon Petit Chou Boutique -- and to Jim and Troy-Leigh for creating the silver spoon markers. They were a big hit! And I can't wait to give the vintage silver fork cheese markers I got for a special friend's birthday coming up very soon. Yesterday, I inspected my own outdoor herb garden and I am happy to report it is coming along nicely. Fortunately, there were several herbs that wintered-over this year -- surviving last year's drought, then winter's snow and frigid temperatures, followed by wind, torrential rains, spring floods and my benign neglect. The rains and flood definitely slowed down this season's planting, so things still look a little rough in some spots. A good layer of mulch is in order, especially before it gets too, too hot, and then all will be right with the garden. Thank goodness herbs are basically weeds that smell nice and taste good, because they make even the most casual gardener look really good! Sage, oregano and chives all survived the winter and have undergone major trimming and shaping. New additions are basil, rosemary, thyme and parsley. Sometimes I think I should just plant lavender and be done! If I could grow anything else as well as I grow lavender ... well, I'd really have something! This is just a tiny snapshot of one plant, and there are about eight others scattered around the different tiers of the garden. The bees and butterflies were very busy yesterday, so I had to tread lightly as I moved around to take these pictures. I'm going to bake some lavender shortbread, pour myself a big cup of coffee and continue to watch the wonders of nature unfold in the garden -- if I ever leave my kitchen, that is! I wish you could smell this lavender shortbread baking. Truly a heavenly mixture of warm vanilla, lemon and lavender scents floating on the air ... ahhh ... and the flavor is just as good as the aroma. See Cora Cooks Lavender Shortbread and other treats featured on Sweet Treats for Saturday at Sweet As Sugar Cookies. it should have read - 1/3 cup powdered sugar. **The floret is the only the little purple flower part. Use only dried lavender flowers packaged for edible purposes or fresh lavender flowers that you know have not been treated with any chemicals. Rinse and dry fresh lavender before using for cooking. The flavor of lavender flowers and leaves intensify when dried, so use only 1/3 the amount of dried lavender to fresh. Store dried lavender in an airtight container. Preheat oven to 325 degrees. In a large bowl, cream together the butter, sugar, vanilla and lavender with an electric mixer. Mix until light and fluffy, about 3 minutes. Add flour and salt; beat until blended. Knead the dough on a flat surface until smooth. Spray a shortbread mold lightly with vegetable oil cooking spray. Press the dough into the shortbread mold. Prick the surface of the shortbread with a fork. Bake for 30-35 minutes, until just lightly golden brown. Cool in the pan for about 10 minutes. Loosen the edges very carefully with a knife and then turn over onto flat surface. (I like to use a very large plate or baking sheet, hold it firmly against the top of the shortbread pan and flip them both over together.) Following the design on the shortbread, cut into pieces while still warm. Cool and store in a sealed container. After mixing and kneading dough, flatten it into a square and wrap in plastic. Chill until firm. On a floured board, roll or pat out the square to a thickness of 1/2-inch. Cut the dough into cookie-size squares. Transfer to baking sheet covered with parchment paper, spacing cookies about 1 inch apart. Prick each cookie several times with a fork. Bake 20 to 25 minutes until pale golden – do not brown completely. Cool slightly, then transfer to a rack. Store in a sealed container.